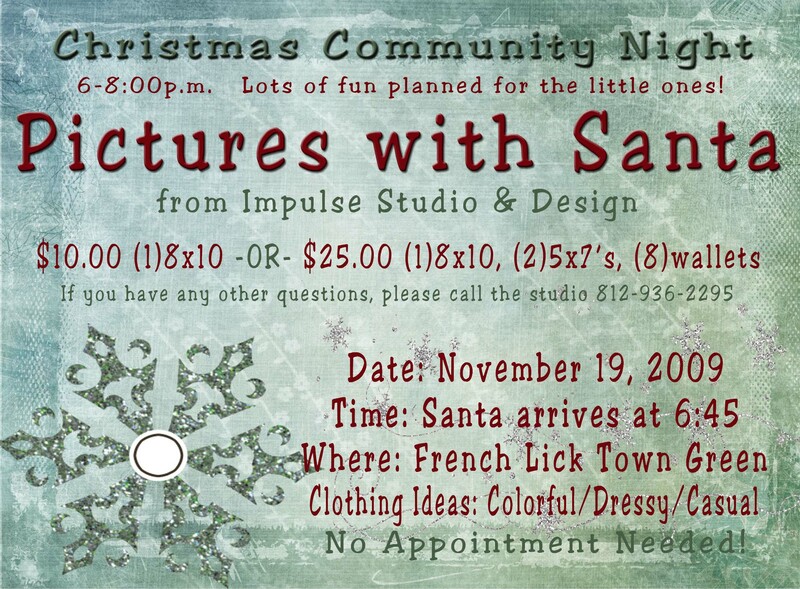 Here is the information that I promised to post… If you have any other questions concerning Pictures with Santa, please call the studio 812-936-2295. Hope to see you on the Town Green this Thursday evening. SPREAD THE WORD… SANTA IS IN TOWN!! Tis the season…. We will be on the Town Green November 19 helping to celebrate Community Night. We were also asked to be the exclusive photographer taking pictures with Santa. The event is happening from 6:00-8:00 with lots of activites for the little ones. Santa will be arriving a little before 7:00. Don’t miss out on this chance to have your childs picture taken with Santa before the season begins…..The perfect time for them to tell Santa what is on their wish list! No appointment needed. Just a sneak peek to one of my favorite families who visit the studio frequently. this is just what BB wanted- LEAVES! And boy, did she get them! What a blast!! We did not do alot of posing… just went with the family fun! I Love Love Love it! Here you go mom… here is a sneak peak at your girls. Every year, you take me to the neatest locations on your property. And this year, I even got a 4 wheeler ride out of it. Thanks for being a return customer every year. We appreciate your business very much! Our studio has been blessed with cute kids here lately. When toddlers come into the studio, they bring with them a totally different environmnet. They have no concerns and no worries. They giggle and laugh and play peek-a-boo without a care in the world. They can be so demanding and so sweet all at the same time. When photographing kids you have to watch, study, interpret, and love them. I hear moms and dads often say in the middle of a session and we are trying to capture the spirit and sparkle that they see at home. That my job must be difficult. Yes it is…. But oh, so very worth it!! Daddy, your gonna have major problems when this little princess grows up. She is too, too cute. And a personaltiy to go along with it. I can already see it, You will have to beat the boys off with a stick…. Here it is the annual Junior/Senior Football photo! We get such a great response from this sitting every year, that we have parents wanting to know if we are going to do them again, before we even know what the theme is going to be. I enjoy working with Mark and his crew. It has been 6 years now that we have been doing this annual shoot and I look forward to it every season. ENJOY!!!! BEST OF LUCK SPRINGS VALLEY BLACKHAWKS!